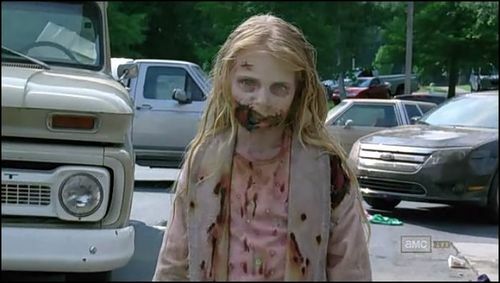 The "little girl zombie" that Rick Grimes comes across during his early traipsing across a post-apocalyptic Georgia. A few months ago when the Blu-ray set came out I wrote about how disturbing it was to see that this sweet innocent cherub-turned-flesheater had a mouthful of braces. 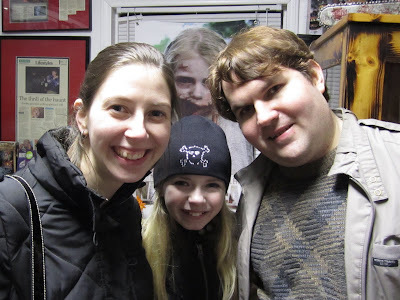 Well, this past weekend at Woods of Terror north of Greensboro, we got to meet this young actress! Her name is Addy Miller and in addition to The Walking Dead she's already notched up quite an acting resume already. She'll soon be appearing in Plan 9 (a remake of Ed Wood's Plan 9 from Outer Space) and will also be in next year's The Three Stooges biopic. And here she is with Kristen and me! Addy autographed a photo for us, writing on it "You're next!" But I couldn't resist asking her something that had been bugging me since getting the Blu-ray set of Season 1: were those her real braces? Turns out: nope! Addy told us that it was all prosthetics and makeup, that they made molds of her jaws and that was a rotting decaying appliance that we saw instead of her actual teeth. VERY cool!